Are you the target of a workplace bully? Or bullies? Are you a bystander in a bullying situation, wondering what to do? Is your boss bullying you or someone you work with? Are you responsible for reviewing or creating a workplace bullying policy for your organization? Is a loved one being bullied at work? Are you a bully who wants to understand what to do to make yourself stop once and for all? Is one of your subordinates bullying you or someone else, and you want it to end constructively? I can help. Workplace bullying can make any job a nightmare. Any job. Coaching for Workplace Bullying can help anyone connected with bullying — not just targets. Supervisors, bystanders, policy makers, abettors, targets, bullies — anyone. In my experience, with the right help, everyone can find a more constructive way to relate to the bullying, and each person who does so brings the entire social group a few steps closer to ending all bullying. Taking any action at all might seem impossible, or impossibly risky. It usually does seem that way when you're in the midst of it. That's one reason why bullying persists. But constructive action most definitely possible. Traveling the road back to civility and safety takes courage, whatever your role is, but with courage and the advice I can provide, you can do it. 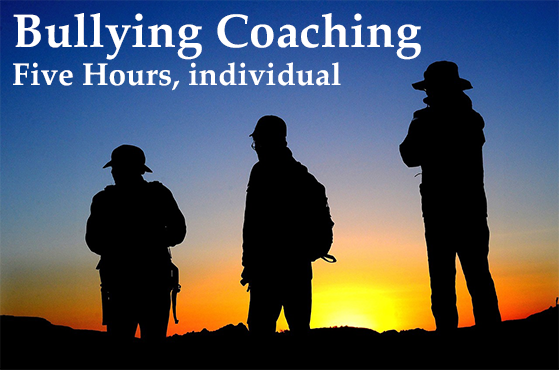 Coaching for Workplace Bullying answers the coaching needs of those touched by bullying, in any role. It can help you find a path that leads away from the bullying cycle to a better way to be. It offers a sharply focused, custom-tailored training to develop skills based directly on your immediate experience and needs. The issues addressed and the means of addressing them are carefully selected and timed to a degree that's impossible in coaching programs of wider scope or in more group-oriented skills development programs. Coaching for Workplace Bullying works because it's personal to you. Discretion is an essential element of the program. At no time will the coach appear publicly with the client in the workplace setting. This serves to protect the client from speculation and rumor, two burdens that affect how others perceive the client. Discretion extends to everyone in the client's workplace — the content of the coaching program is never revealed to anyone. Most engagements are conducted entirely by telephone. We'll explore together how we might work together to uncover and address opportunities for ending the bullying, and for ensuring that it does not recur. Together, we develop goals and objectives for the program, but we're always ready to respond to urgent situations that might arise along the way. This item is an introductory block of five hours, at the individual self-supported hourly rate. After an introductory no-charge consultation, if we both feel that it's time to get started, you can then order this item.